The four-year-old Jack Russell named Hook was trapped down the warren for hours. 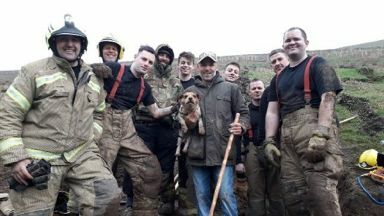 The four-year-old Jack Russell named Hook got stuck underground while out walking with owner Kevin McKenna near Lennoxtown, East Dunbartonshire. Scottish Fire and Rescue Service station manager Brian Byrne said: "Our firefighters worked tirelessly as a team, using state-of-the-art specialist equipment as well as manually digging what probably amounted to as much as five tonnes of soil and stones. "In what was a physically demanding task, our crews showed extreme professionalism and compassion throughout, and showed exactly what being a firefighter means. "It's incidents like this that show how our staff will go above and beyond in order to provide a service which is second to none." Mr McKenna's brother-in-law Stephen Cobain said: "We took him to the vet for a check-up and he's totally fine - he's now jumping about as if nothing happened. "It was a tough and emotional few days, but the firefighters did such a fantastic job."